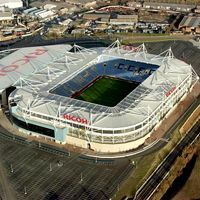 Coventry: City to leave Ricoh Arena for 2013/14? Yesterday morning Coventry City chief executive Tim Fisher gave a very harsh comment about the inability to further use Ricoh Arena. “The fact is that we are being locked out of the Ricoh Arena. We have been told that there is no further room for negotiation and an offer that we made to get back round the negotiating table has been rejected. “It is with great regret that we now have no alternative but to consider other arrangements for next season and we would be failing the club, its supporters and its staff if we did not start making such plans now. Coventry City are in administration at this time due to insolvency and season ticket sale plunged as fans don’t know what will happen with their team. A potential move to Walsall Banks’s Stadium seems most probable (23 miles or 35km from Coventry). Fisher’s statement left Ricoh Arena operators stunned. James Powell of Walker Morris, the law firm representing ACL, quickly retaliated: “We are absolutely flabbergasted by Tim Fisher’s statement. “Mr Fisher is the sole director of Coventry City Football Club Limited, a company that is now in administration as a result of a “catastrophic insolvency” in the words of the barrister acting for the administrator. “To compound this issue, Mr Fisher is now suggesting that Coventry City Football Club should play their games outside Coventry. We have to question on this basis alone whether he is acting in the best interests of the football club? ACL assure the club are welcome to play their fixtures at Ricoh Arena and the ‘door is wide open’.